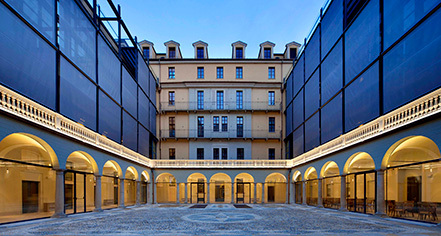 The NH Collection Turin Piazza Carlina is a short walk to the Royal Palace of Turin, a UNESCO World Heritage Site, along with 13 other residences of the House of Savoy. 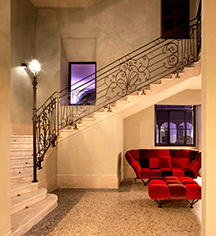 Without changing its original architecture or fascinating history, this charming and elegant 17th century building, set around a beautiful courtyard, has been renovated into a unique four-star hotel. It oozes a stylish and refined atmosphere, thanks to its exquisite décor and contemporary design, where fine elements come together with modern facilities. This Italian hotel boasts 160 cozy, spacious, and comfortable guestrooms, equipped with convenient amenities, stylishly furnished, with some rooms featuring balconies with breathtaking views of the city. Guests can train in the rooftop fitness center or relax in the massage area. The hotel has a broad inner courtyard, overlooked by five floors. It also boasts two stunning terraces, where guests can enjoy the city’s superb skyline. The array of unique highlights is completed by a delightful aromatic garden from which the chef picks herbs for daily meals served in the Carlina Restaurant. The hotel was named after the popular Carlina Square (Piazza Carlina), the local name for the Carlo Emanuele II Square (Piazza Carlo Emanuele II), and places it within easy reach of Turin's most acclaimed city landmarks, such as the Mole Antonelliana which currently houses the National Museum of Cinema, the Royal Palace of Turin, and the Egyptian Museum. The peaceful Valentino Park and Po River can be reached by a pleasant walk. NH Collection Turin Piazza Carlina, a member of Historic Hotels Worldwide since 2017, dates back to the 17th Century. When it was a residential building, one of its most famous residents was Italian Marxist theorist and politician, Antonio Gramsci, who was a founding member and one-time leader of the Communist Party of Italy. Airport Transportation: An airport car may be arranged through the hotel's concierge, rates apply. Cancellation Policy: Cancellation policy varies based on rate, room, or package booked. Deposit: Deposit policy varies based on rate, room, or package booked. Early Check-In/Late Check-Out: Available depending upon availability, rates apply. Extra Person Fees: 20 euros per night. Hotel/Resort Fees & Taxes: City tax is 3,70€ per person per night. Occupancy Restrictions: Varies by room type; one extra bed per room allowed. Payment: All forms of payment are accepted - cash, credit cards, and bank transfer. Pet Policy: Pets allowed; 20€ per night. The NH Collection Turin Piazza Carlina is a short walk to the Royal Palace of Turin, a UNESCO World Heritage Site, along with 13 other residences of the House of Savoy. Learn more about the History of NH Collection Turin Piazza Carlina .